That you did Ash, and you're not wrong on your first point either - time for bed for all of us I feel. Thanks for joining us though. We'll see you next time. Ash Green: I think I need a lie down, because I swear I just saw Bayern miss four penalties in a shootout against Dortmund. You can also text us on 81111 in the UK only - but please don't forget to include your name and location. One of you - and you will remain nameless for dignity's sake - tweeted in just before that farce began suggesting an all- German penalty shoot-out would only go one way. Ruthless efficiently it was not though. A 2-0 win on penalteis? Back-to-back David Beckham-in-Portugal-esque slips? 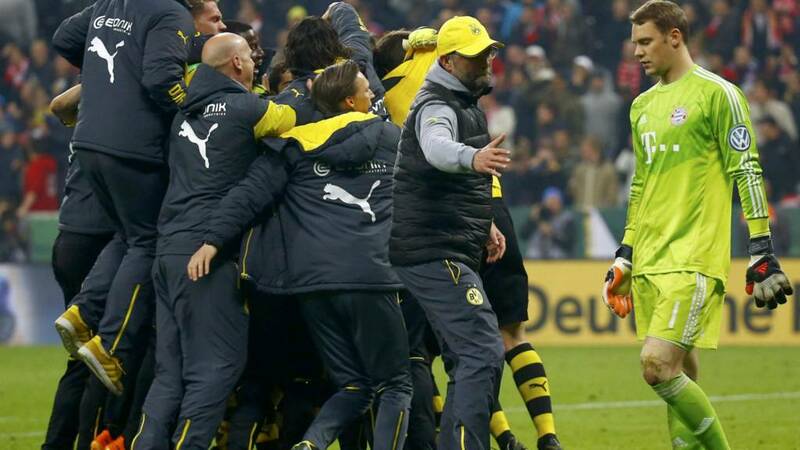 Pure joy for Jurgen Klopp - his yellow cap is bouncing around in anticipation of what would be a great way to sign off his Dortmund career. A German Cup final in Berlin on 30 May. Get the Deutsche Bahn tickets booked now lads. Arminia Bielefeld play Wolfsburg tomorrow to decide who gets to stop them. Hmm, maybe I'm seeing things. Keeper Manuel Neuer steps up and fires his effort against the crossbar. Good dive from Manuel Neuer, diving to his right with a strong palm. What is happening here? Keeper dives to his right. It is a decent height and well saved. Low, precise, sends the keeper the wrong way. Clinical. That's more like it. It is all just a little case of history repeating. Unbelieveable! Alonso also slips - and like Lahm smashes his effort wide of the target. No problem here - the spot kick is smashed into the top corner. David Beckham? Reckon so. Lahm slips and pumps his effort over the bar. Both Klopp and Guardiola were going at it with both barrels there. Surely the two sides could hear each other it was so loud. Anyone fancy taking a penalty against Manuel Neuer? Pep Guardiola is barking out his orders to a Bayern huddle three-men deep while Jurgen Klopp holds court in the centre circle. Marco Reus is getting more treatment for cramp. What's German for pick your spot and don't change your mind? Penalties to decide who reaches the German Cup final. Honours even after 120 minutes. Shouts for handball? Mitchell Weiser is penalised for use of his arm in the Dortmund box. Relax, it's not a penalty. Free-kick. Plenty more pens on there way for those who do like them. Sighs of despair as Bayern centre-back Jerome Boateng blazes over from outside the box. From there? Really? With one minute left? Robert Lewandowski is back on and Mitchell Langerak claims a cross from right on top of him. He looks very sluggish indeed. Three minutes of injury time to play. ... which is claimed expertly by Manuel Neuer. Robert Lewandowski is looking a bit dreamy after that clash with Mitchell Langerak. Should he be coming back on? Agonisingly close for Bayern! Mario Gotze fires the ball just wide with Mitchell Langerak stranded. The goalkeeper took himself out but taking out Robert Lewandowski in the build-up. The Bayern bench are up in arms and want a penalty. Guardiola's got his fists very tightly clenched indeed. Bastian Schweinsteiger misses another header! He's free in the box again and even closer than the last one - two yards out? - but Mitchell Langerak does well to block. Medhi Benatia now goes into the book. Are the home side losing their discipline? They're certainly struggling to find (or re-find) their rhythm. Pep Guardiola adjusts his trousers, but there's no rip on show tonight. Yet. He's ready. Mohsin BCFC: This one's going to penalties. Neither side deserves to win. Bayern being careless and Dortmund taking what they can get. We're probably still heading for penalties though. The pace of the game has slowed right down, and if there was ever any doubt about Dortmund's intentions then Pierre-Emerick Aubameyang's hoof up the field tells you all you need to know. But now we do have a red! Kevin Kampl was booked late in the second half - he only came on as a sub - and now walks for a second yellow. Sokratis is penalised for a foul on Bastian Schweinsteiger and the home crowd want red. The Greek defender was booked for a foul on Schweinsteiger about five moments ago but the referee sees it differently. Free-kick Dortmund. We're heading for penalties aren't we? Back under way after a few hugs, a few pats on the back, and most likely a few firm words. And half-time in extra-time it is. What a turnaround we've seen since Bayern were forced out of cruise control. They're even looking vulnerable at the back. Dortmund are defending in numbers now and are looking to slow it down. Goalkeeper Mitchell Langerak wants to launch it early but is waved down. Almost calamity at the back for Bayern though as Pierre-Emerick Aubameyang's cross is 'dealt with' by a combination of Manuel Neuer's gloves and Medhi Benatia's face. Was there a shout? Apart from 'ouch' that is. Benatia looks wobbly. Those are some serious paws. And from the free-kick Bastian Schweinsteiger has to score! Xabi Alonso's cross finds him just yards out but the Germany international heads agonisingly over. A real let off for Dortmund. Bastian Schweinsteiger imposes a bit of experience on the game. He launches himself on a powerful run, surging towards the Dortmund goal, but is cut down by Sokratis. What they call a good foul. Yellow card. It's a bit of a phony war so far this extra-time malarkey. Neither side are creating much to threaten. Will Dortmund settle for penalties? The onus has to be on Bayern you feel. Another brave intervention from Mats Hummels as Bayern press again. They've started extra-time with the same pattern they started the regular 90 - plenty of possession - but it's all slowed down. Slow from Dortmund too as Marco Reus is lazy to be caught offside. A chance to break wasted. Sokratis and Mats Hummels take turns to launch themselves into head-rattling defensive clearances as Bayern look for a way over the top. Not a lot of subtlety about that. One change to mention - Dortmund have brought on Sebastian Kehl for Sven Bender. I'm sure there are more tired legs out there though. Pep Guardiola's an intense man isn't he? I mean i don't suppose you win so many titles without it. The Catalan catches Robert Lewandowski unawares with an up-close-and-personal gee-up. Right in his face. Marco Reus meanwhile, has been getting treatment for cramp. So who's your money on? This one was all Bayern for so long that you feel Dortmund must have the psychological edge as we head into 30 minutes more. Two minutes of stoppage time played already. From where? Marco Reus sums up his night so far with a wayward volley from outside the box. Marco van Basten-esque it was not. What a challenge from Sokratis on Mario Gotze. The German international was in World Cup-winning territory there, but the Greek defender slid in with perfect timing to win the ball. More bite from Dortmund in midfield but they give the ball back straight away. They just can't seem to keep it. Mario Gotze is jinking down the left wing now. No dice though. Dortmund standing firm. Those changes seem to have broken the spell Dortmund were enjoying. Either that or Bayern have just realised they're in danger of throwing this one away, having dominated for 75 minutes. Patient, probing play, looking for a winner. Five minutes to go for Dortmund to make this count. Jurgen Klopp must be all over the place. Jakub Błaszczykowski has come off the the away side, replaced by Kevin Kampl. This could be a big moment for Bayern. Forget this match, what about the Champions League too? Arjen Robben is coming off. He looks to have hurt his calf again. Mario Gotze comes on but that's a huge blow for Pep Guardiola's side. Marco Reus is almost - again almost - played through but Juan Bernat covers well. But moments later he does find himself through and Manuel Neuer makes a great save low down to his left to turn his shot wide of the post. What on earth has gone on here?! Total transformation. Henrikh Mkhitaryan! The Armenian attacking midfielder really has made the difference since coming on. Manuel Neuer can only turn his latest effort - a vicious volley - wide of the post, the ball fizzing off his wrists. Here come Dortmund again! Marco Reus almost latches on to a through ball but Medhi Benatia leans him out of it and Manuel Neuer collects. Not so cool back there was he? Bayern have made another change - Bastian Schweinsteiger replacing Thomas Muller. And with just their second shot on target Dortmund draw level! Pierre-Emerick Aubameyang slides in at full stretch to meet a Henrikh Mkhitaryan cross, Manuel Neuer flaps the ball away but it's already crossed the line. Dortmund finally register their first shot on target but in truth Pierre-Emerick Aubameyang's header took a thick slice off a Bayern shoulder. Naturally Manuel Neuer is as cool as ever. Dortmund change things too and Shinji Kagawa makes way for Henrikh Mkhitaryan. Will the Armenian make the difference? And can he do it quicker than Arjen Robben? I thought it would be right winger Mitchell Weiser to make way - although he's looked decent tonight - but Thiago is coming off for Arjen Robben. A wave of applause sweeps around the stands as Arjen Robben is seen warming up. The Dutchman must be relishing taking on these tired Dortmund legs. Not a great one this time from the evergreen Xabi Alonso (who is still sporting a terrific beard you'd be glad to know). One moment of genius could drag Dortmund back into this game, but Marco Reus, the man you'd have thought would be best-placed to provide it, has been a spectator in the main. Rafinha is booked for a wild challenge. Easiest decision the referee will ever make. The danger seems to have passed, for now in any case. Dortmund can breathe again and look to keep hold of the ball. Frustration for Klopp as Marco Reus is penalised for a foul on Medhi Benatia and Bayern are back with it, Thiago peeling through the static Dortmund midfield as the home side force a corner. Thiago now with a chance as he turns in the box to find space. There's loads of it for the former Barca man, but no power whatsoever on his left-foot strike. Easily gathered. Robert Lewandowski shows lovely technique to fire a shot against the bar from outside of the box. So close for the Poland international. Dortmund had been growing in the last few minutes but got away with that one. Two in fact - as the referee waves away Bayern claims for a penalty. Thomas Muller was the man closest to it as Marcel Schmelzer raised an arm. Ball to hand or hand to ball? A bit of both? There's a real creeping inevitability about this one. Bayern are in full flow, cutting forward with ease to the rhythm of the home fans unflagging support. But here's Marco Reus! He's in space on the edge of the box but flashes a shot wide. Deflection and corner but normal service is resumed as Bayern press the away side back to square one. Thomas Muller denied! Mitchell Weiser jinks away from the Dortmund left-back and plays a beautifully weighted pass into Muller's stride, but Mitchell Langerak is out quickly to block. A second Bayern goal kills this one you feel. No changes at the interval from either side. Dortmund get us back under way. Jurgen Klopp is wearing a gilet on the sidelines. In homage to Tim Sherwood? Or the other way round possibly. Here we go then, Dortmund's players are giving it mouth in the tunnel. Plenty of geeing up going on. Much more in attack required from them in this second half. Bayern don't look ruffled. Wednesday's second semi-final sees third tier club Arminia Bielefeld take on Wolfsburg. Bielefeld have already knocked out three top flight sides in Hertha Berlin, Werder Bremen and Borussia Mönchengladbach. Can they make it one more against Wolfsburg? The cup is Dieter Hecking's side's only chance of silverware. They have run Bayern closer than any other team this year (is 15 points that close?) but have already missed out on the title. Where next for Jurgen Klopp? John McEnerney: Only one place for Klopp to go and that's Manchester City or maybe Arsenal if they ever come to their senses and cut Arsene Wenger loose. Come to the PL JK! You can also texton 81111 in the UK only but please don't forget to include your name and location. And all this without the (not original) dynamic duo of Franck Ribery and Arjen Robben. Robben has been in sensational form for Bayern this season but has only just returned from injury to make the bench tonight. The break. And Dortmund need it. Can Jurgen Klopp work his magic at half-time? If not there's only one way this one is going. Bayern have been cruising it. Robert Lewandowski take a bow! Just for the sheer invention and courage to have a go from there. The Poland striker does go for the lob from a ridiculous angle and is mighty close to making it two zip, the ball landing just wide of Mitchell Langerak's goal. Another Xabi Alonso corner but this time it's met by the head of Mats Hummels. Pierre-Emerick Aubameyang - he is so rapid - is let loose on the break and momentarily Manuel Neuer is scrambling back. Did he think Aubameyang was going to go for the lob? Bayern soon crowd it out though. Nothing doing for Klopp and co so far. The Dortmund players must be desperate for the interval. They've been chasing the ball pretty much non-stop for the best part of 40 minutes. Tricky to keep composed in possession when you're shattered. If Jurgen Klopp wants to bow out with a fairytale finish at the German Cup final then he's got his work cut out now. Bayern are looking very comfortable. How on earth do they move the ball so quickly? How can Dortmund respond now? They risk leaving themselves open to being caught out again if they go for it - Bayern's goal came straight after a dangerous-looking Dortmund break. As we've seen so often this season, Bayern are ruthless on the counter. They might not need him at this rate actually after all. Robert Lewandowski is deadly - at the second attempt. Played through on goal - he beats the offside trap expertly - the Poland striker chips over the keeper but is denied by the post, before providing a lovely finish from a very, very tight angle to put his side 1-0 up. Fully deserved. Here comes Bayern's Mitchell Weiser down the Dortmund left. A few stepovers aren't going to fool anyone into believing he's actually Arjen Robben though. Dortmund continue their resistance. How long until the real Robben is risked? Phillip Lahm in particular has looked so assured in possession in the Bayern midfield. Fine, he's a world class full-back, but Pep throwing him in midfield has given the 31-year-old even greater influence. Bayern's best chance remains that Thomas Muller header though. For all their good interplay, there's still been only one shot on target. Dortmund need to keep it now and they're lucky to do so as Pierre-Emerick Aubameyang takes a heavy touch into the channel. Bayern do win it back though. It's almost inevitable as wave after wave of scampering striped shirts harries the Dortmund yellow. Bayern are bossing it. 75% possession. There's been some lovely touches from a midfield that looks streets ahead of their Dortmund counterparts. Half-time at Barcelona and Luis Suarez has put the home side 5-0 up just before the break. live text commentary by clicking here. Thomas Muller's header definitely the best opening of the game so far. Bayern are dominating possession but Dortmund are looking solid. Apart from the awful marking at that corner of course. Erik Durm's been a busy lad in these first 15 minutes or so. Already he's been up threatening on Bayern's left and now he covers Juan Bernat to concede a corner. Xabi Alonso floats it in and Thomas Muller flashes wide with a free header. Of all people, surely you pick up Muller? Shinji Kagawa. He wasn't great for Manchester United, granted. But he's been looking far more comfortable in the yellow of Dortmund since. The Japanese is found by Marco Reus and sprays a pass out wide looking for Erik Durm, but there's too much on it. The first interchange of note from Dortmund though. Slick in the midfield as Reus picked the ball up and turned on Bayern's goal. Thomas Muller floats a ball in looking for Robert Lewandowski but it's poor and Australian Mitchell Langerak can gather. At the other end a Sven Bender pass is over-hit. This one is yet to get going in earnest. Neuer played in Schalke's 5-0 victory over Duisburg in the 2011 German Cup final, before moving to Bayern later that year. The Bavarian club have feature in each of the last three finals, winning twice. He was Germany's 'sweeper-keeper' at the World Cup but will he have much to do tonight? The early signs are ominous for Jurgen Klopp's side as Bayern stroke the ball around very comfortably. Like a team who've just won the league. Marco Reus. Boy do Dortmund need a big performance from him tonight. This could be a game of few chances for the away side. Bayern get us going and Thomas Muller finds space on the left immediately. His cut-back is cut out. Here we go then. Pep emerges from the tunnel to embrace a still-beaming Klopp and the two banks of players shake hands. Dortmund huddle, while Bayern's players high-five. Before we get under way a word to the wise. Barcelona are also in action tonight, at home to Getafe. Luis Enrique's side are already 4-0 up after just over half an hour played. The Bayern fans are pumped, the stands are packed and we are almost under way. Arjen Robben is back for Bayern but only on the bench. So far, Jurgen Klopp is pleased to see him. Dortmund were bottom of the table in January but have since crawled their way back to obscurity and eighth. Qualification for the Europa League remains a possibility, but far more glorious would be silverware and a ticker tape parade on Klopp's last day on 30 May. Their opponents tonight beat them in the final of last year's competition, but Dortmund routed Bayern 5-2 to win the cup three years ago. "We have to know that we have been an uncomfortable opponent for Bayern," said Klopp. "I have the feeling that we are not without a chance against them. "Bayern does not gift anything away and that is why we must be present with all our senses from the very beginning. But I can't reach this aim with my words. We have done many things so that we can compete well, but we must bring the performance to the pitch. This game is everything." Already your predictions as to where Jurgen Klopp might be managing next season are flying in. OJ, Manchester: Klopp to take the summer off, sink some premium rauchbier, take the lay of the land and then join Bournemouth in January after Eddie Howe's inevitable post-Christmas dismissal. Champions League football at the Goldsands within five years. Pep is certainly not taking Klopp's challenge too lightly. Bayern beat Dortmund 2-0 in extra-time to win last year's German Cup but the former Barcelona boss isn't counting his chickens. "He is a super guy," Guardiola said of Klopp. "I think our relationship has been very good right from the beginning. We have the last game against each other. He wants to win and I want to win. This game is completely different situation to last season. It's very close." crowned German champions for a record 25th time this season. With four league games to spare Pep Guardiola's side can now switch their focus to matching the success of 2013, when Jupp Heynckes led the club to the treble of Bundesliga, German Cup and European Cup. Bayern have one job out of the way and face Barcelona in the Champions League semi-finals on Wednesday. But tonight they are up against a side looking to silver line a season to forget. Dortmund could be dangerous. losing 2-1 to Bayern at Wembley. This ain't the time for no goodbyes though. The floppy-haired one is focussed on setting the stage for what would be a grand finale at the Olympic Stadium in Berlin on 30 May. So much so that he gave Bayern's offer of a floral presentation in respect of his achievements at Dortmund before tonight's game very short shrift indeed. "It's a nice gesture," he said. "But we're armed for battle and we don't want to be softened by being given flowers. I don't sense any end-of-an-era feeling." As ever we'd love to hear from you. Arjen Robben returns from injury to make the bench as Bayern manager Pep Guardiola makes five changes to the side that beat Hertha Berlin 1-0 on Saturday. Xabi Alonso, Medhi Benatia, Thiago Alcantara, Rafinha and Juan Bernat all come in. Dortmund midfielder Ilkay Gundogan returns to the side after recovering from a throat infection. Sebastian Kehl makes the bench having recovered from a fracture rib. Bayern XI: Neuer, Alonso, Benatia, Thiago, Lewandowski, Rafinha, Boateng, Bernat, Lahm, Muller, Weiser. Dortmund XI: Langerak, Durm, Sokratis, Hummels, Schmelzer, Kuba, Bender, Gundogan, Kagawa, Reus, Aubameyang. But what about Pep Guardiola you say? Well Franz did also stress how much he likes the Spaniard, who is expected to extend his role as Bayern manager beyond the end of next season. "I can't imagine Guardiola would leave in 2016," the former Bayern defender said. "He likes Munich. He has had success with the team and he knows that he can succeed in the future. He has everything he wants." Still, Pep to City, Klopp to Bayern? Would that mean Manuel Pellegrini goes to West Ham? Just where are you off to Jurgen? Are you ready for Jurgen Klopp's last 'Klassiker'? Or at least, his last as Dortmund manager? stepping down at the end of the season speculation on his next destination has been lurching all over the place. First he was taking a break, then it was Manchester City, next West Ham and now?